Anda loves Coarsegold Online, the massively-multiplayer role-playing game where she spends most of her free time. It's a place where she can be a leader, a fighter, a hero. It's a place where she can meet people from all over the world, and make friends. 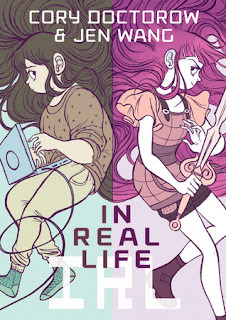 From acclaimed teen author (Little Brother, For the Win) and Boing Boing editor Cory Doctorow and Koko Be Good creator Jen Wang, In Real Life is a perceptive and high-stakes look at adolescence, gaming, poverty, and culture clash. I've been meaning to get a chance to read one of the great YA Comics offerings from First Second Books, so I was glad when I remembered to stash In Real Life in my purse before going off to the hair dresser today. In Real Life starts off with an introduction that is pretty intense. I was thinking, "Wow, this is heavy right off," but I came to appreciate it. For one, it gave me the reader necessary background to the story I was about to read. I would have still understood and enjoyed the story without it, but it definitely helped. Secondly, it set the tone for the comic. This is not just a light picture story. This is a deep narrative that does a good job of social commentary of our modern time, and it shows that everything is not always just what meets the eye. Jen Wang's drawings are bright, happy, and engaging. Many years ago, I did some research into Second Life for an article I was writing. I set myself up in the world with an avatar and tried to navigate around. I was completely floored by everything I saw in there and by what I learned. The idea that things that were happening in virtual reality could actually impact my real reality was mind boggling. I couldn't believe it when I learned that real money was exchanged between Second Lifers -- and more. Admittedly, I have not kept up with Second Life since then, so I have no idea what it looks like or how it operates in 2017. Because of my experience with Second Life, I could sort of understand Anda's introduction to the world of Coarsegold Online. But this story was also completely completely unique, and I enjoyed the exploration of economy, gaming, girl power, identity, growth, and more that this graphic novel showed me.